After a long night, we woke up around 10 and headed down to the lake to take a boat ride to San Pedro. 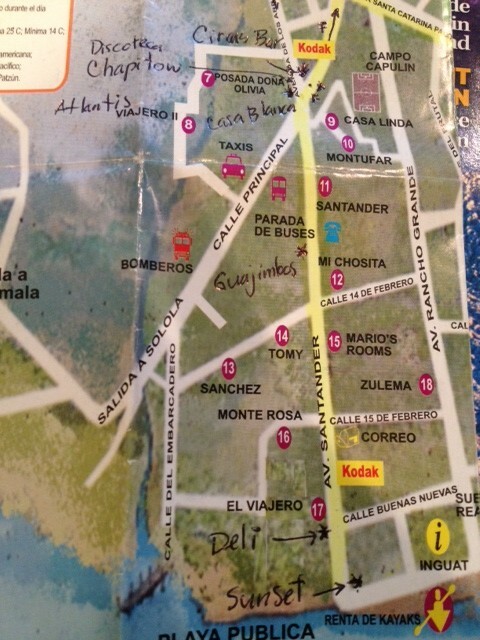 The owner of our hotel recommended checking out San Juan (artsy town) or San Antonio (larger town) if visiting San Pedro. Most of the boat tours leave at 8:30 or 9:30 in the morning. You basically go to 4 or 5 different downs spending an hour in each city and arriving back around 3:30. 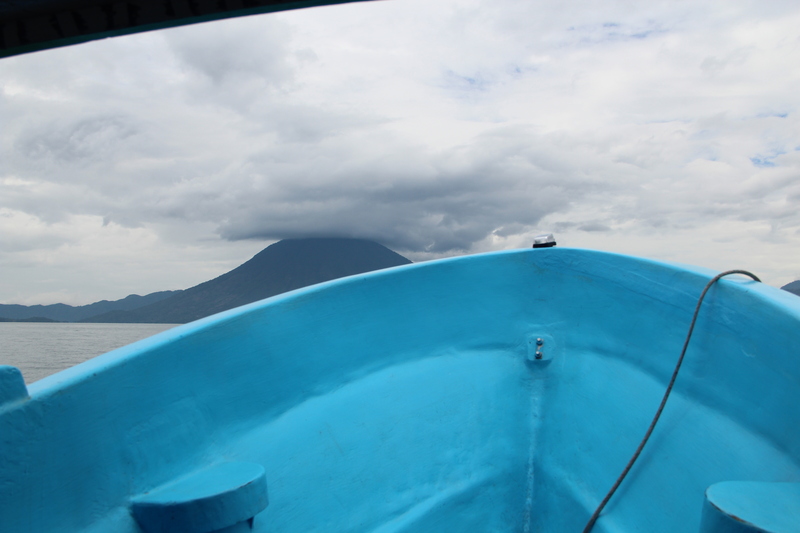 We had our minds set on seeing San Pedro so we simply opted for a boat transfer to town. We figured this would allow us to see the lake and get a flavor of the different towns. To get to the boats, you simply follow the main road down to the docks. All of the boats are located within 100 meters of each other. You will be asked by numerous people on the way if you would like a ride on the lake. There are supposedly a number of different boat options. We decided to wait for the collectivo boats, which wait until they fill up. These cost about $3.00 USD for a ride (25Q). We only needed to wait 15 minutes, but there were some people that waited 45 minutes for the boat to leave. I recommend always going into the boat with the most people. In our case, there was only one boat. Even with collectivos, there are supposedly express boats that go straight to your town and then local boats that go to different towns. I believe our boat was the local boat since it did first go to San Pedro and then went to San Juan. The last option is to hire a private boat for 200Q. We believe the quote of 200 was for the local currency and not in USD. He simply said 200 and thought it was too steep. In the high season, I imagine that there are a ton of boats in the high season going around the lake. As a result, I wouldn’t worry about making reservations to get a boat ride in advance. 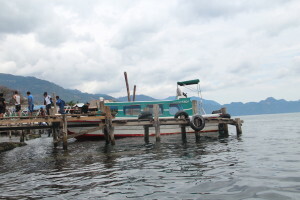 All of the souvenir shops also listed various boat tours. It is my guess that these are the express boats that leave at set times. They will charge you money and probably won’t save you that much time in the end. With that said if you are going to some of the more remote spots, I would recommend getting the express boat. From what I read online, my impression was that Panajachel would be horrible. You would see all these tour buses and it would be mobbed with people. I think that impression is totally wrong. It might be because we were traveling in low season, but it wasn’t mobbed with people. I didn’t see one tour bus in the entire town. There are more souvenir shops in Panajachel than in San Pedro and San Juan, but I also think that is reflection of simply more travelers. 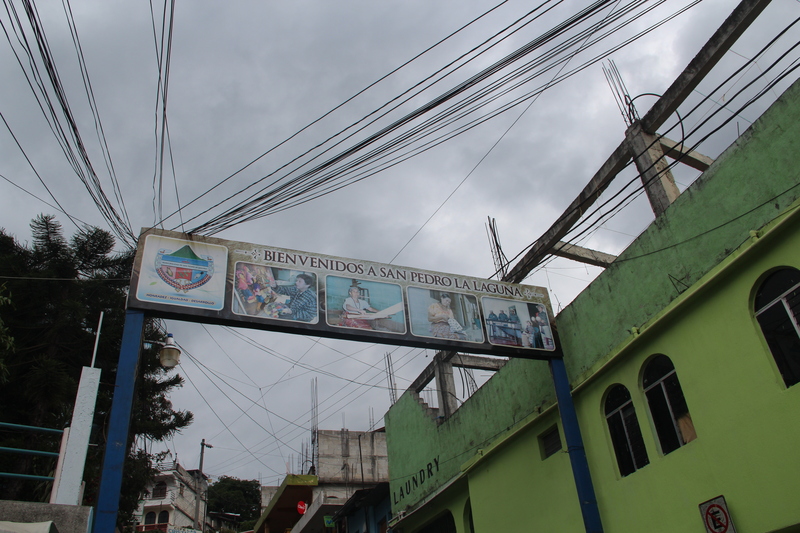 We were traveling with two girls that prefer the added safety of nicer hotels that Panajachel had to offer that San Pedro didn’t offer. We also didn’t need to have the backpacker feel. There appeared to be a lot more restaurant options in Panajachel over San Pedro as well, which we liked. San Pedro is definitely the hipster town. Most of the tourists are backpackers. If you want the backpacker feel, it is definitely the place to be at on the lake. If you also enjoy the illegal substances, it is also probably the place to go. There are less cops in San Pedro and things just happen more often. The last of the 5 pictures is a view of the road that runs along the lake where the main backpacker area is located. There is more on the street than the picture indicates. We had lunch at a Hummus shop in the town and saw many other little restaurants in the town. 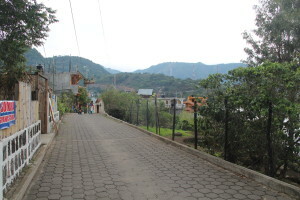 All of this occurs near the lake and if you go up the hill which starts after the sign welcoming you to San Pedro will take you to where the locals live. This is what you see in second and fourth pictures. 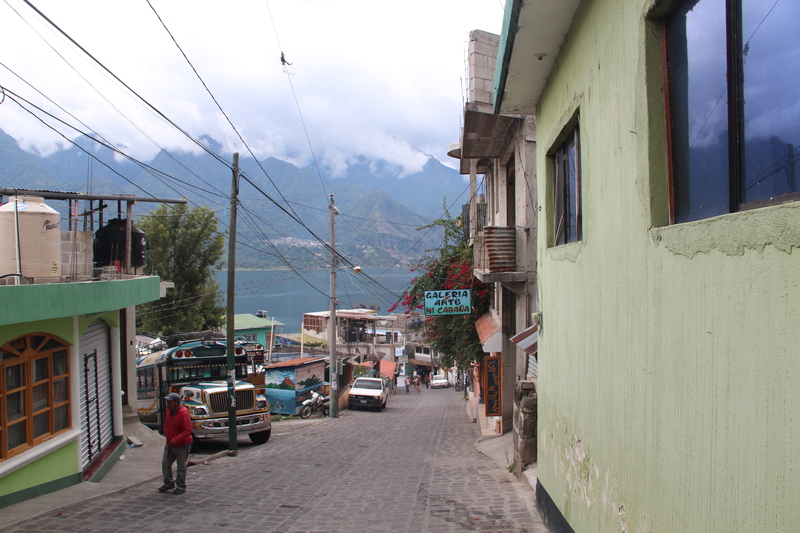 The last main difference between San Pedro and Panajachel is that the hotel accommodations are cheaper. 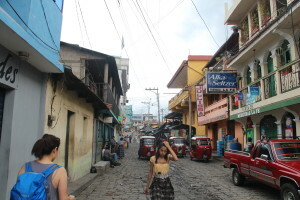 Overall, I think San Pedro is a great place for someone who wants backpacker feel and save some money. 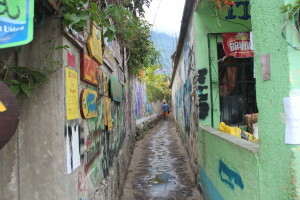 With that said, Panajachel is not that much more expensive and has more restaurants and more bar options. 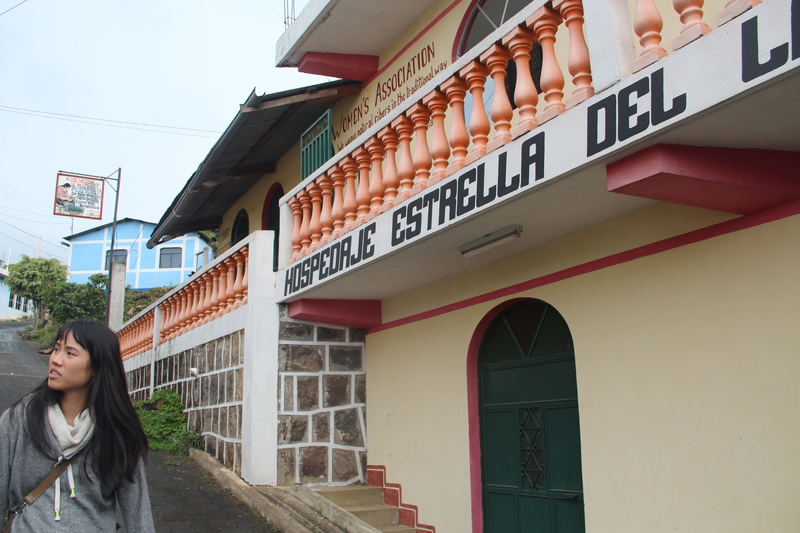 The mix of people is just more slanted towards locals and/or other Central American travelers. San Juan is a nice town if you don’t want to be around a lot of other people. The main attraction, shown in the third picture, is a local weaving association. 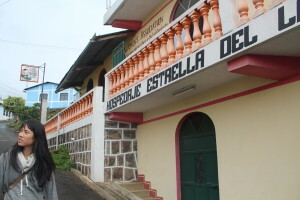 All of the cloths/souvenirs are made by locals in the association. The tag will indicate the actual name of the person making the garments. If you like that type of thing, I think San Juan might be good place to stay or at least visit. 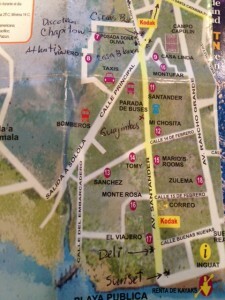 We took a 5 – 10 minute Tuk Tuk ride from San Pedro to San Juan for $5 USD. It was very cheap and quicker than taking a boat. San Marcos is a town talked about a lot about in the books. 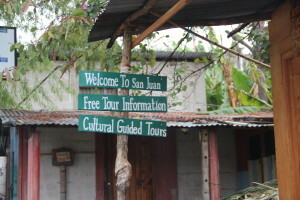 As with San Juan, I would stay in San Marcos if you are couple looking to stay away from the tourist crowds. 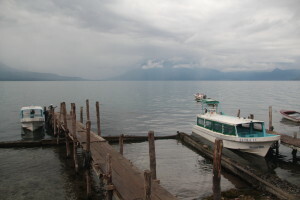 If you want to be with other people, I would go to San Pedro or Panajachel. We enjoyed Panajachel and thought it offered good nightlife, good food, and good accommodation. We didn’t need to pay more money for this privledge. San Pedro is definitely the best spot if you like illegal substances, backpacker feel, and/or low on cash. The accommodations are more basic, but you can enjoy the area. San Juan and San Marcos are for those people that want to get away from all of the crowds. The food in Guatemala is amazing. We really loved the food in Panajachel, and I actually preferred it over the food in Antigua. You get a lot of food for your money. We would order a feast, and it would only come to $10 dollars. All of the main restaurants are located alone the same main road. Our favorite meal was the dinner that we got at the third place listed above. We got Fajitas that were amazing. The view is also awesome.